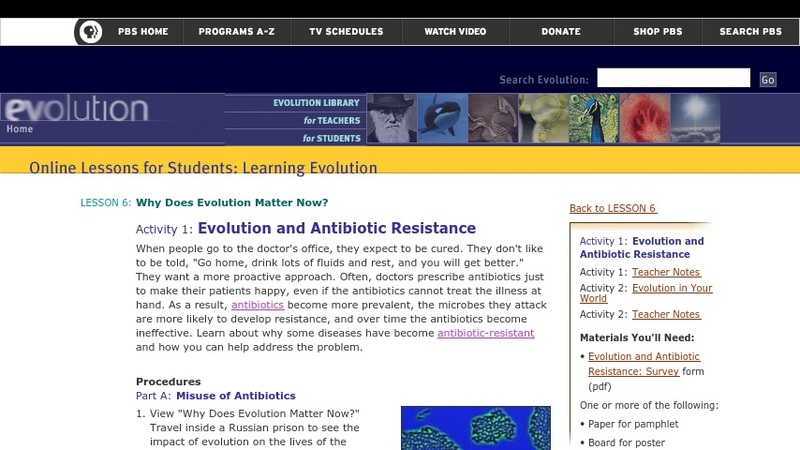 This page contains three student activities for learning about evolution of antibiotic resistance. The first activity involves two videos (freely available on the website), follow-up questions, and classroom discussion. The second activity is a survey about antibiotic use/misuse that students are to conduct in their neighborhoods. The third activity is a group effort to produce an educational presentation about antibiotic resistance. There are teacher notes for all three activities. This activity set is part of a larger educational unit on the relevance of evolution to everyday life. This unit is appropriate for middle- or high-school students.